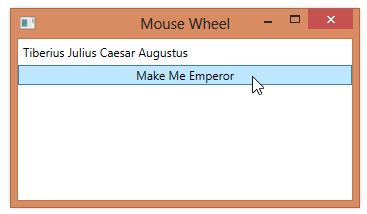 When the user rotates the mouse wheel, the PreviewMouseWheel and MouseWheel events will fire. The PreviewMouseWheel event tunnels down the logical tree, firing for the topmost element and working down to the element that the mouse pointer was located over when the mouse wheel was rotated. The MouseWheel event then fires, bubbling up the logical tree and firing for each element until the topmost element is reached.